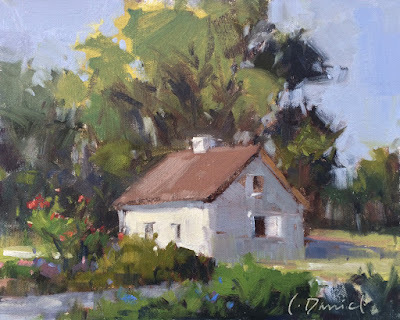 Laurel Daniel Blog: Flowering Shadows - with process shots! When I am painting a lot in the studio on larger works, I tend to be working from small studies and photographs as my source material. After awhile, I just want to paint from life. 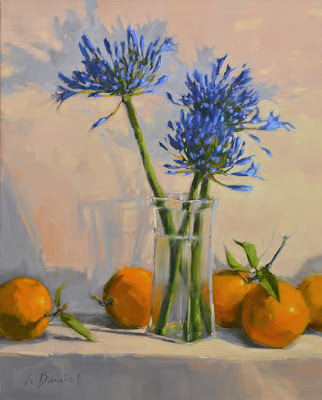 When the grocery store offered Agapanthus in the middle of winter, I knew it was time for a still life! It's offers a visual break and change of pace for my painter's brain. This is one of 25 new works that will be in the solo show next week. Visit my website to see the whole collection! Click HERE! Below are process shots that reveal how the painting came together. Painting directly, wet into wet. The set up in my studio. Love this painting, and I know what you mean -- it feels so good to paint from life. The process shots are super. The blue flowers set off the Clementines perfectly. Wonderful as always, and your show is going to be amazing!